In response to ATP binding, the P2X7R facilitates cation channel activation, nonspecific pore formation, rapid changes in plasma membrane morphology, and secretion of IL-1β from LPS-primed macrophages. To investigate the relationship between the P2X7R-dependent changes in plasma membrane organization and the release of IL-1β, we generated time-lapse movies of ATP-stimulated BAC1 murine macrophages in conjunction with biochemical analyses of IL-1β release. Similar image analyses in human embryonic kidney 293 cells expressing recombinant P2X7R (HEK-P2X7) permitted comparison of P2X7R-dependent effects in macrophage vs nonmacrophage backgrounds. Whereas HEK-P2X7 cells exhibit zeiotic blebbing within 5 min of ATP treatment, BAC1 macrophages initiated a distinct “tethered” blebbing 10 min after ATP addition. This blebbing was comparably induced by the P2X7R-selective agonist BzATP and was blocked by P2X7R inhibitors KN-62 and oxidized ATP. Blebbing was initiated at ATP concentrations ≥3 mM, but optimal IL-1β release occurred at 1 mM ATP. P2X7R-dependent blebbing was abrogated in the presence of Rho-effector kinase inhibitors Fasudil and Y-27632, but ATP-induced IL-1β release was unaffected. ATP-induced activation of RhoA could be detected in both HEK-P2X7 cells and BAC1 murine macrophages. Thus, P2X7R activation signals distinct, novel membrane blebbing events (dependent on RhoA activation and Rho-effector kinase activity) and simultaneously initiates release of IL-1β. Our observations that blebbing and IL-1β release are dissociable suggest these events occur via parallel rather than convergent signaling pathways. Release of the proinflammatory cytokine IL-1β from activated macrophages is an important component of the innate immune response to bacterial infection or tissue damage. IL-1β is unusual in that it lacks an N-terminal amino acid leader sequence to allow translation at the endoplasmic reticulum-associated ribosomes and subsequent packaging into secretory vesicles (1). Rather, it is synthesized and stored in the cytosol as an inactive precursor (pro-IL-1β) in response to NF-κB-dependent gene transcription activated by LPS. To be released as a biologically active cytokine, pro-IL-1β must be proteolytically cleaved by caspase-1, which itself must be cleaved from its zymogenic procaspase form, by caspase-11 in mice, by caspase-5 in humans, or by poorly understood autocatalytic mechanisms (2, 3). Continued exposure of monocytes to LPS has been shown to facilitate a basal level of IL-1β release, but LPS alone is insufficient to trigger IL-1β processing and release from macrophages (4). However, agents that collapse ionic gradients, such as nigericin, bacterial pore-forming toxins, neutrophil antimicrobial peptides, hypotonic stress, or ATP acting through the P2X7R, rapidly promote activation of caspase-1, followed by the processing and release of both caspase-1 and mature IL-1β into the extracellular medium of activated macrophages (5, 6, 7, 8). The mechanism of this release remains poorly understood, and various explanations have been suggested. Some studies have indicated that IL-1β is released simply by lysis of the activated macrophage (9). It has also been suggested that an ATP-binding cassette (ABC)3-type transporter may be necessary, given that ABC transporter inhibitors can block IL-1β processing and release and that certain ABC transporters are capable of facilitating movement of peptide substrates (10, 11). Others have proposed that IL-1β packaged within microvesicles may be released from activated monocytes in response to ATP signaling through the P2X7R (12). The P2X7R is a member of the P2 purinergic family of receptors, which functions as an ATP-gated ion channel in excitable tissues and in hematopoietic-derived immune cells (13, 14). The P2X7R is unique in that its affinity for ATP is extremely low. The EC50 of ATP for the receptor is ∼500 μM, whereas the EC50 of 3′-O-(4-benzoyl)benzoyl-ATP (BzATP), a synthetic, P2X7R-selective agonist, is ∼50 μM (15). Upon binding of agonist, the P2X7R facilitates a rapid, bidirectional flux of cations, thereby triggering depolarization, collapse of the Na+ and K+ gradients, and massive influx of Ca2+. Furthermore, continued stimulation of the P2X7R allows formation of a large, nonspecific pore, allowing permeability of molecules up to 800 Da via recruitment of a distinct pore-forming moiety (16). A similar nonselective pore can also be activated by maitotoxin (MTX), a potent marine toxin that can induce rapid death of multiple cell types, regardless of P2X7R expression (17). The role of the P2X7R in mediating cell death is complex, with some reports demonstrating rapid P2X7R-dependent cytolysis and other reports indicating a delayed, P2X7R-mediated apoptosis (18). Significantly, P2X7R activation facilitates the massive processing and release of IL-1β from monocytes and macrophages (4, 19). P2X7R-knockout mouse macrophages cannot release IL-1β in response to ATP treatment, and P2X7R-knockout mice exhibit marked resistance to anti-collagen-induced arthritic progression, presumed to be mediated by IL-1β (20, 21). Surprenant and colleagues (22) have recently demonstrated that P2X7R activation induces microvesiculation and dramatic membrane blebbing within seconds to minutes of ATP treatment in human embryonic kidney 293 (HEK293) cells that stably overexpress the rat P2X7R. Microvesiculation refers to the rapid release of membrane-enclosed particles (<0.5 μm in diameter) in response to elevated intracellular Ca2+. These microvesicles are characterized by phosphatidyl serine externalized to the outer membrane leaflet (12, 23). Blebbing is defined as a phenomenon in which large membrane-bound vesicles protrude rapidly from the cell surface and are roughly hemispherical and devoid of organelles (24, 25). Zeiosis is a subtype of blebbing characterized by dynamic extrusion and subsequent retraction of membrane-bound blebs (26, 27). Blebbing has been observed during such processes as mitosis, cytokinesis, differentiation, and apoptosis (25, 28). The apoptotic cells generally begin zeiotic blebbing within 3 h of initial treatment with proapoptotic agents as a direct result of caspase activation and subsequent cleavage of various cytoskeletal substrates. Caspase-8 activity has been localized specifically to membrane blebs on apoptotic cells and may act to cleave and activate caspase-3, which in turn can cleave and activate Rho-effector kinase-I (ROCK-I). The latter is an effector kinase associated with the small GTPase Rho, which facilitates membrane blebbing (29, 30, 31). Formation of large membrane blebs has also been observed during treatment of endothelial cells with MTX and, furthermore, the phenotype of MTX-induced blebs can be shifted to zeiosis in the presence of certain pharmacological inhibitors (27, 32). The function of blebbing is unclear, although it occurs in response to Ca2+-dependent changes in actin-myosin contractility and has been proposed to promote autophagy during apoptosis, to act as an autoantigen, or to be involved in cellular locomotion (33, 34, 35). We hypothesized that P2X7R-dependent blebbing may play an important role in proper processing and release of IL-1β, given that P2X7R activation triggers both processes within 5–10 min of ATP treatment. Therefore, we sought to compare blebbing in both a nonmacrophage background (HEK293 cells that heterologously express the P2X7R) and a macrophage background (BAC1 murine macrophages that natively express the P2X7R) and to establish a possible correlation with IL-1β release. We found that blebbing could be induced only by high (>3 mM) concentrations of ATP or BzATP, in contrast with IL-1β processing and release, which occurred optimally at submillimolar ATP or BzATP. Whereas zeiotic blebbing was clearly demonstrated in HEK293 cells expressing recombinant P2X7R (HEK-P2X7), a novel form of “tethered” blebbing was observed in BAC1 macrophages. Pharmacological inhibition of the ROCKs abrogated both zeiotic blebbing and tethered blebbing, but it did not disrupt IL-1β secretion. Finally, we demonstrated that the ROCKs are activated via P2X7R-dependent activation of RhoA, in both macrophages and HEK-P2X7 cells. Thus, the P2X7R can signal two distinct phenotypes of plasma membrane reorganization, dependent on the Rho-associated kinases, and these dramatic changes in membrane organization can be dissociated from ATP-induced release of IL-1β. ATP, BzATP, and oxidized ATP (oATP) were acquired from Sigma-Aldrich (St. Louis, MO). ROCK-I inhibitors Y-27632 and Fasudil/HA1077 were purchased from Calbiochem (La Jolla, CA), whereas the caspase inhibitors Tyr-Val-Ala-Asp-chloromethyl ketone (YVAD-cmk) and Asp-Glu-Val-Asp-chloromethyl ketone (DEVD-cmk) were obtained from Bachem (Torrence, CA). Abs for ELISA analysis of murine IL-1β were from Pierce-Endogen (Rockford, IL). The monoclonal anti-IL-1β Ab 3ZD, which recognizes both 33-kDa pro-IL-1β and mature 17-kDa IL-1β (murine and human) in Western blot analysis, was provided by the Biological Resources Branch of the National Cancer Institute-Frederick Cancer Research and Development Center (Bethesda, MD), whereas Abs against ROCK-I, ROCK-II, and RhoA were purchased from Santa Cruz Biotechnology (Santa Cruz, CA). KN-62 was purchased from Biomol (Plymouth Meeting, PA). The vital dye YoPro was purchased from Molecular Probes (Eugene, OR). LPS was purchased from List Biological Laboratories (Campbell, CA). All other salts and chemicals were of reagent grade. Rhotekin beads were acquired from Cytoskeleton (Denver, CO). The BAC1.2F5 macrophage cell line, a clone of the SV40-transformed murine macrophage cell line BAC1, was maintained using previously described protocols (36). Wild-type HEK293 cells and HEK cells stably transfected with the human P2X7R were maintained as previously described (37). Cells were plated to 80–90% confluence. For experiments requiring LPS treatment before ATP stimulation, 1 μg/ml LPS was dissolved in DMEM/10% calf serum/1% penicillin-streptomycin and added to the cells, followed by incubation at 37° for 4 h. The culture medium was removed, cells were washed with PBS, and buffered saline solution (BSS) containing 25 mM HEPES, 130 mM NaCl, 5 mM KCl, 1 mM CaCl2, 1 mM MgCl2, 5 mM glucose, and 0.01% BSA (pH 7.4) was added to the cells. For experiments using inhibitors, the inhibitors were preincubated with the cells in minimal medium for at least 15 min before addition of ATP and were present in the medium throughout the duration of the ATP pulse. ATP was then added directly and, after 30 min, the extracellular medium was collected and centrifuged briefly to pellet cellular material for subsequent Western or ELISA analysis. The remaining adherent cells were lysed in buffer containing 25 mM HEPES (pH 7.7), 300 mM NaCl, 1.5 mM MgCl2, 0.2 mM EDTA (pH 8.0), 0.1% Triton X-100, 2 μg/ml leupeptin, and 100 μg/ml phenylmethylsulfonyl fluoride. For assessment of cell-associated IL-1β levels, cell lysates were separated by SDS-PAGE (15%) and electrophoretically transferred to polyvinylidene difluoride (PVDF) membranes either for 15 h at 30 mV (in 0.5× Towbins buffer containing 1.51 g of Tris + 7.2 g of glycine + 100 ml of methanol per liter) or under rapid-transfer conditions (in 1× Towbins buffer containing 3.03 g of Tris + 14.4 g of glycine + 200 ml of methanol per liter) for 45 min at 1 mAmp. PVDF membranes were rinsed in immunoblot buffer (10 mM Tris (pH 7.4), 0.9% NaCl, 0.05% Tween 20, and 1 mM EDTA) and blocked for 1 h in immunoblot buffer containing 4% nonfat dried milk (Sigma-Aldrich). PVDF membranes were then incubated in primary Ab for IL-1β at a dilution of 1/1000 in immunoblot buffer containing 4% milk at room temperature for 1 h. Membranes were then washed (1 × 15 min, 2 × 5 min) and incubated with 1/5000 dilutions of HRP-conjugated goat anti-mouse Ab (Santa Cruz Biotechnology) in 4% milk-immunoblot buffer for 1 h at room temperature. Membranes were washed and developed using chemiluminescent reagents (SuperSignal from Pierce-Endogen) for 0.5–5.0 min and exposed to x-ray film (Eastman Kodak, Rochester, NY). For assessment of extracellular medium for IL-1β content, soluble proteins were acid precipitated using 72 μl of 100% trichloroacetic acid and 15 μl of 10% cholic acid per 1 ml of extracellular medium. The precipitated proteins were rinsed in acetone, followed by dissolution in Laemmli buffer. Five- to 25-μl aliquots of extracellular medium sample were assayed for IL-1β content by sandwich ELISA. Briefly, a 96-well plate was coated with 1 μg/ml primary anti-murine IL-1β overnight, and then was blocked with 4% BSA in PBS for 1 h. Plates were washed three times with wash buffer (50 mM Tris-HCl (pH 7.5), 0.2% Tween 20). Aliquots of medium samples or murine IL-1β standards diluted to 50 μl with PBS were added to the blocked wells together with 50 μl of the second, biotinylated anti-murine IL-1β Ab (0.2 μg/ml). The plates were incubated at room temperature for 2 h and then were washed three times. The captured immune complexes were colorimetrically detected by subsequent incubations with streptavidin-HRP conjugate (0.1 μg/ml), washing, development with tetramethylbenzidine substrate for HRP, and absorbance measurement using a SoftMax Pro plate reader (Molecular Devices, Sunnyvale, CA). Cells, either HEK-P2X7 or BAC1 macrophages, were grown to confluence. The culture medium was removed, and the cells were washed once with ice-cold PBS and were then incubated in BSS at 37°C. Agonist (ATP, BzATP, or ADP) was added to the cells, vs water in controls, for 30 min. The extracellular medium was then removed and the cells were lysed in a rhotekin lysis/wash buffer containing 25 mM Tris-HCl (pH 7.5), 150 mM NaCl, 5 mM MgCl2, 1% Nonidet P-40, 1 mM DTT, 5% glycerol, 1 μg/ml aprotinin, 2 μg/ml leupeptin, and 100 μg/ml PMSF at 4°C. When GTPγS was used to fully activate small GTPases, EDTA was added to the lysates to chelate divalent cations, followed by the addition of 10 μM GTPγS and incubation at 30°C for 30 min. MgCl2 was then added to the lysates to terminate the GTPγS activation of RhoA. Lysates were cleared via centrifugation at 16,000 × g for 15 min at 4°C, and the supernatant was transferred to a new tube. To this supernatant was added 30-μg rhotekin beads, followed by incubation overnight at 4°C with shaking to bind all activated RhoA to the beads. The beads were then washed three times, followed by incubation with 4× SDS-PAGE buffer at 100°C to dissociate the activated RhoA from the rhotekin beads. The sample was then separated on an SDS-PAGE gel followed by immunoblot for RhoA. To characterize the P2X7R-dependent release of IL-1β from BAC1 macrophages in detail, we conducted dose-response and kinetic analysis experiments to establish the optimal ATP concentration and time course for IL-1β secretion. We detected IL-1β by both ELISA and Western blot techniques. Analysis of the extracellular medium from LPS-primed macrophages treated with varying concentrations of ATP indicated that IL-1β secretion was maximal at 1 mM ATP, with higher ATP concentrations leading to reduced IL-1β release (Fig. 1⇓A). Treatment of macrophages with 1 mM ATP for varying lengths of time showed that IL-1β release was not detectable by ELISA until between 10 and 15 min, at which point release was initiated in an essentially linear, nonsaturating manner through 30 min (Fig. 1⇓B). Longer term treatments of macrophages with ATP were not conducted because such treatment has been shown to induce lytic cell death, which could lead to spurious increases in IL-1β detected in the extracellular medium (18). Although the ELISA technique is purported to be 100-fold more sensitive for detection of mature 17-kDa IL-1β over 33-kDa pro-IL-1β, we assayed both the cell-associated and externalized fractions for pro- and mature IL-1β with Western blot analysis to indicate that the ELISA signal primarily reflected mature IL-1β rather than pro-IL-1β. As shown in Fig. 1⇓C, pro-IL-1β was detected within the macrophages and begins to decrease in direct correlation with an increase in detectable mature IL-1β in the extracellular medium. The ELISA data quantitatively reflect the mature IL-1β levels detected by Western blot (Fig. 1⇓, A and C). Because all extracellular media must be acid precipitated using BSA as a carrier protein for use in Western blot analysis, absolute normalization of extracellular IL-1β levels can be difficult, and hence the ELISA is used for more accurate extracellular IL-1β quantification. A slight delay in progression from processing to release was also evident, given that no mature IL-1β was detected outside the cells at 10 min, yet mature IL-1β was clearly present in the cell-associated fraction (Fig. 1⇓D). Thus, these data indicate that BAC1 macrophages are an appropriate model for studying ATP-induced IL-1β processing and release. One millimolar ATP optimally initiates IL-1β processing and release within 10–15 min of macrophage treatment. IL-1β processing and release from BAC1 macrophages. For all experiments, BAC1 macrophages were plated at 1 × 106/ml, LPS activated (1 μg/ml) for 4 h, and then transferred to BSS containing 25 mM HEPES, 130 mM NaCl, 5 mM KCl, 1 mM CaCl2, 1 mM MgCl2, 5 mM glucose, and 0.01% BSA. A, Macrophages were treated with increasing concentrations of ATP for 30 min at 37°C. The extracellular medium was collected and analyzed by ELISA for IL-1β release. Results are from four independent experiments. B, Macrophages were treated with 1 mM ATP for increasing amounts of time, up to 30 min, at 37°C. The extracellular medium was collected and analyzed by ELISA for IL-1β release. Results are data from four independent experiments. C, Macrophages were treated with increasing concentrations of ATP for 30 min at 37°C. The extracellular medium was acid precipitated as described in Materials and Methods, and protein equivalent to 5 × 105 cell equivalents was loaded in each lane for SDS-PAGE separation on a 15% gel. The cell lysates were generated by adding Laemmli buffer directly to the adherent macrophages and loading 5 × 105 cell equivalents per lane. Transfer to PVDF membranes was conducted, followed by blotting with monoclonal anti-IL-1β Ab, which recognizes both pro- and mature IL-1β. D, Macrophages were treated with 1 mM ATP for increasing amounts of time, up to 30 min, at 37°C. Western blot analysis was conducted as described in C.
To correlate ATP-induced IL-1β processing and release with time-dependent changes in macrophage morphology and plasma membrane organization, we used time-resolved phase-contrast and fluorescence video microscopy. BAC1 macrophages were plated on coverslips for microscopy, equilibrated in BSS, and then stimulated with varying concentrations of ATP at the 5-min time point in the video recordings. These experiments (and all subsequent experiments) were conducted using BSS supplemented with 1 μM YoPro, a vital dye that enters the cells in response to P2X7R-dependent pore formation and fluoresces upon binding nucleic acids within the cell. In most experiments, the macrophages were also primed for 4 h with 1 μg/ml LPS to induce pro-IL-1β expression. As shown in Fig. 2⇓, no YoPro fluorescence was present in the cells before the addition of ATP, but fluorescence becomes visible and quantifiable within a few minutes after the addition of ATP. With a 3-mM ATP stimulation, the cells initiated a dramatic form of blebbing. This blebbing is morphologically distinct from zeiosis in that individual blebs are extruded for a longer period of time before they are retracted, are larger relative to the cell size, and are constricted near the plasma membrane, prompting us to refer to them as “tethered” blebs (27). Generally, blebbing was initiated 5–10 min after addition of ATP, and dye uptake continued throughout the duration of the experiment. As shown in Table I⇓, concentrations of ATP ≤ 1 mM were insufficient to induce blebbing, although YoPro fluorescence, and thus P2X7R-dependent pore formation, was visible and quantifiable using SimplePCI software. Furthermore, the majority of cells demonstrated tethered blebbing, which can be completely inhibited in the presence of either 300 μM oATP or 3 μM KN-62, known antagonists of the P2X7R (Table I⇓; data not shown) (37, 38). LPS treatment of the cells had no immediate effect by itself, and LPS priming did not alter the ATP-induced blebbing phenotypes observed under any conditions (data not shown). To confirm that this effect was mediated by the P2X7R rather than G-protein-coupled P2Y receptors also expressed in murine macrophages, we used the synthetic agonist BzATP to selectively activate the P2X7R (39). This agonist has a 10-fold greater potency at the P2X7R, with an EC50 of ∼50 μM for activation of either ion flux or pore formation in macrophages (15). Surprisingly, we observed that concentrations of BzATP that maximally activate the P2X7R (300 μM or 1 mM), as judged by YoPro dye uptake, were insufficient to induce tethered blebbing observed with 3 mM ATP treatment. BzATP induced tethered blebbing only at concentrations of 3 mM or greater (Table I⇓). This suggests that tethered blebbing is not due solely to activation of the P2X7R-dependent changes in membrane permeability, because the blebbing response is induced only by supramaximal concentrations of agonistic nucleotides. BAC1 macrophages demonstrate ATP-induced tethered blebbing. BAC1 macrophages were cultured on glass coverslips as described in Materials and Methods and treated with 3 mM ATP at time 5 min in the presence of 1 μM YoPro in BSS medium at 37°C. Merged phase and fluorescence images (green pseudocolor) are shown at 5-min intervals. Large tethered blebs can be observed within 10 min of ATP treatment at time 5 min. These blebs are dynamically extruded and retracted as can be more clearly seen in the supplemental material. The bottom panel quantifies YoPro dye fluorescence changes as a function of time, indicating P2X7 pore formation. It has been previously reported that HEK293 cells that stably express the rat P2X7R undergo rapid induction of blebbing when stimulated by high levels of ATP or BzATP (22). We sought to further characterize this response and to compare it with the blebbing observed in BAC1 macrophages. HEK-P2X7 cells were plated on coverslips for microscopy, equilibrated in BSS, and then stimulated with various concentrations of ATP at the 5-min time point in the video recordings. Fig. 3⇓ shows no significant YoPro entry before the addition of ATP. However, YoPro uptake was initiated immediately after ATP treatment, and blebbing was observed within 1–2 min and continued for at least 10 min, after which it decreased in activity and intensity. The P2X7R-dependent blebbing observed in the HEK293 cell background was similar to the dynamic process of extrusion and retraction of membrane-associated bodies termed zeiosis. This process has previously been described for apoptosis and MTX-induced blebbing in the presence of certain pharmacological inhibitors (27, 28). Quantification of these results is summarized in Table II⇓, indicating that nearly all the HEK-P2X7 cells blebbed in response to 3 mM ATP. However, when a submaximal (300 μM) concentration of ATP was used, blebbing was not significantly induced, even though substantial YoPro dye uptake was measured. Comparable results were obtained using BzATP such that concentrations <3 mM were insufficient to induce significant blebbing (data not shown). When the HEK-P2X7 cells were pretreated with either 300 μM oATP or 3 μM KN-62, the cells neither blebbed nor demonstrated significant YoPro uptake in response to 3 mM ATP (Table II⇓; data not shown). Similarly, when HEK293 cells stably transfected with empty vector were treated with 3 mM ATP, they neither accumulated YoPro nor blebbed (Table II⇓). This indicated that the observed blebbing and dye uptake were strictly dependent on P2X7R activation and were not triggered by nucleotide activation of the P2Y1 and P2Y2 receptors natively expressed in HEK293 cells. HEK-P2X7 cells demonstrate ATP-induced zeiotic blebbing. HEK293 cells stably expressing the P2X7R were cultured on glass coverslips as described in Materials and Methods and were treated with 3 mM ATP at time 5 min in the presence of 1 μM YoPro in standard BSS medium. Cells were maintained at 37°C, and both phase and fluorescence images were acquired at 30-s intervals. Merged phase and fluorescence images (green pseudocolor) are shown at 2.5-min intervals. Zeiotic blebbing can be particularly observed at the 7.5- and 10-min time points, as well as in the supplemental material. The bottom panel quantifies YoPro dye fluorescence changes as a function of time, indicating P2X7R-dependent pore formation. The Rho-effector kinase ROCK-I has been shown to play a necessary role in blebbing induced during apoptosis as a result of caspase-3-mediated cleavage of ROCK-I to its constitutively active form. We tested whether the ROCK-I enzyme also played a role in blebbing induced by P2X7R activation, and to this end we tested two distinct ROCK inhibitors, Y-27632 and Fasudil/HA-1077. Previous studies indicated that these inhibitors do not affect other kinases at the concentrations used in our experiments, with the exception of ROCK-II (40, 41). Preincubation of cells with Y-27632 before induction of apoptosis was sufficient to abrogate blebbing induced by caspase-3-mediated cleavage of ROCK-I (29, 31). Therefore, we preincubated HEK-P2X7 cells with either 10 μM Y-27632 or 10 μM Fasudil and found that HEK-P2X7 cells did not bleb (zeiotic or otherwise) in response to ATP in the presence of either inhibitor (Fig. 4⇓; Table III⇓). These cells showed P2X7R-dependent YoPro dye influx, but no P2X7R-induced blebbing, thereby implying a role for P2X7R activation of ROCK kinases in the blebbing initiated by extracellular ATP. Effect of a ROCK inhibitor on blebbing in HEK-P2X7 cells. HEK-P2X7 cells were cultured under conditions identical with those in Fig. 3⇑, except that the cells were preincubated with the ROCK inhibitor Y-27632 (10 μM) for 30 min before 3 mM ATP stimulation. The cells clearly show evidence of P2X7R activation, as indicated by the presence of YoPro dye uptake; however, no blebbing can be observed at any time after ATP addition at 5 min. The bottom panel quantifies YoPro dye fluorescence changes as a function of time, indicating P2X7R-dependent pore formation. We then tested whether ROCKs were also involved in ATP-induced blebbing in BAC1 macrophages natively expressing the P2X7R. Preincubation of BAC1 macrophages with either 10 μM Fasudil or 10 μM Y-27632 completely abolished ATP-induced tethered blebbing, analogous to blockade of ATP-induced zeiotic blebbing in HEK-P2X7 cells (Fig. 5⇓; Table IV⇓). P2X7R activation was indicated by the rapid increase in YoPro fluorescence nearly immediately after ATP addition. The appearance of the macrophages was very distinct during P2X7R activation in the presence of the ROCK inhibitors. Analysis of the time-lapse movies indicated that the macrophages seem incapable of retracting extruded plasma membrane, ordinarily one of the first observable responses to P2X7R activation (Figs. 2⇑ and 5⇓). The time-lapse movies also indicated a dramatic, cell-localized ruffling activity in which vesicles appear to be rapidly transported throughout the cell. These observations strongly suggest that the ROCKs play an important role in regulating the macrophage cytoskeleton as well as in facilitating P2X7R-dependent bleb formation in both the HEK-P2X7 cells and mouse macrophages. ROCK inhibitors disrupt tethered blebbing in macrophages. BAC1 macrophages were cultured under conditions identical with those shown in Fig. 2⇑, except that the cells were preincubated with the ROCK inhibitor Y-27632 (10 μM) for 30 min before stimulation with 3 mM ATP. Cells were maintained and data were collected as described in Fig. 2⇑. No blebbing can be detected; however, the cells have an unusual morphology not seen in the absence of the ROCK inhibitor, in which an ability to retract extruded cytoplasm is markedly impaired. Also, cell motility is markedly reduced, as can be clearly seen in the supplemental material. The bottom panel quantifies YoPro dye fluorescence changes as a function of time, indicating P2X7R-dependent pore formation. Given that caspase-3 can cleave ROCK-I to a constitutively active form, we tested whether the rapid caspase-1 activation induced by ATP stimulation of BAC1 macrophages might also activate ROCK-I and subsequent blebbing. It is unlikely that caspase-3 itself might activate ROCK-I during ATP stimulation, given previous reports that P2X7R-dependent caspase-3 activation and apoptosis are not observed until at least 2 h after ATP stimulation (18, 42). BAC1 macrophages were stimulated with 3 mM ATP and examined for blebbing in the presence of the following inhibitors: 30 μM YVAD-cmk, 100 μM YVAD-cmk, or 50 μM DEVD-cmk. At the lower concentration, YVAD-cmk is a relatively specific inhibitor of caspase-1, whereas at the higher concentration, it acts as a pan-caspase inhibitor (43). DEVD-cmk is a caspase-3-specific inhibitor. Under these conditions, neither YVAD nor DEVD disrupted tethered blebbing in ATP-stimulated BAC1 macrophages, indicating that caspase activation is not a necessary prerequisite for P2X7R-dependent, ROCK-mediated blebbing (Table IV⇑). Given the marked effects of ROCK inhibition on P2X7R-dependent membrane blebbing, we speculated that inhibition of these kinases might also repress the ATP-induced release of IL-1β from macrophages. BAC1 macrophages were primed with 1 μg/ml LPS to induce pro-IL-1β expression. Before stimulation with 1 mM ATP, the macrophages were pretreated with either caspase inhibitors or ROCK inhibitors. In accord with previous observations in other proinflammatory cell types, incubation of BAC1 macrophages with either 30 μM or 100 μM YVAD-cmk completely abolished ATP-induced IL-1β processing and release (Fig. 6⇓A). However, incubation of cells with increasing concentrations of either Y-27632 or Fasudil had no effect on the ability of BAC1 macrophages to effectively activate caspase-1 and externalize IL-1β in response to a 30-min stimulation by 1 mM ATP, as determined by either ELISA (Fig. 6⇓B) or Western blot analysis (Fig. 6⇓C). These results demonstrate that P2X7R-dependent tethered blebbing is activated by signals distinct from those that activate P2X7R-dependent IL-1β processing and release. IL-1β processing and release is blocked by YVAD-cmk, but not by ROCK inhibitors. For all experiments, BAC1 macrophages were plated at 1 × 106/ml and LPS-treated for 4 h before transfer into BSS as described. For inhibitor experiments, inhibitors were preincubated with the cells in BSS medium before treatment with ATP. A, Extracellular medium was analyzed by ELISA for IL-1β from cells that had not been treated with ATP, had been treated with 1 mM ATP, or had been treated with 1 mM ATP in the presence of either 30 μM YVAD-cmk or 100 μM YVAD-cmk. Results are from three independent experiments. B, Extracellular medium was analyzed by ELISA for IL-1β from cells that had not been treated with ATP, had been treated with 1 mM ATP, or had been treated with 1 mM ATP in the presence of either 10 μM Fasudil or 10 μM Y-27632. Results are from three independent experiments. C, 15% SDS-PAGE blot of the acid-precipitated extracellular medium from BAC1 macrophages pretreated with increasing concentrations of either Fasudil or Y-27632, followed by a 30-min, 1-mM ATP pulse. Western blot analysis with mouse anti-IL-1β mAb shows the presence of both pro- and mature forms of IL-1β released from macrophages, regardless of the presence of a ROCK inhibitor. Although it was clear that the P2X7R-dependent signals that initiate blebbing are distinct from those that initiate caspase-1 activation and subsequent IL-1β secretion, we did not understand how ROCKs were being activated. Therefore, we used rhotekin-Rho-binding domain (RBD) beads to determine whether ATP treatment of cells specifically activated RhoA, and thereby activating ROCKs. 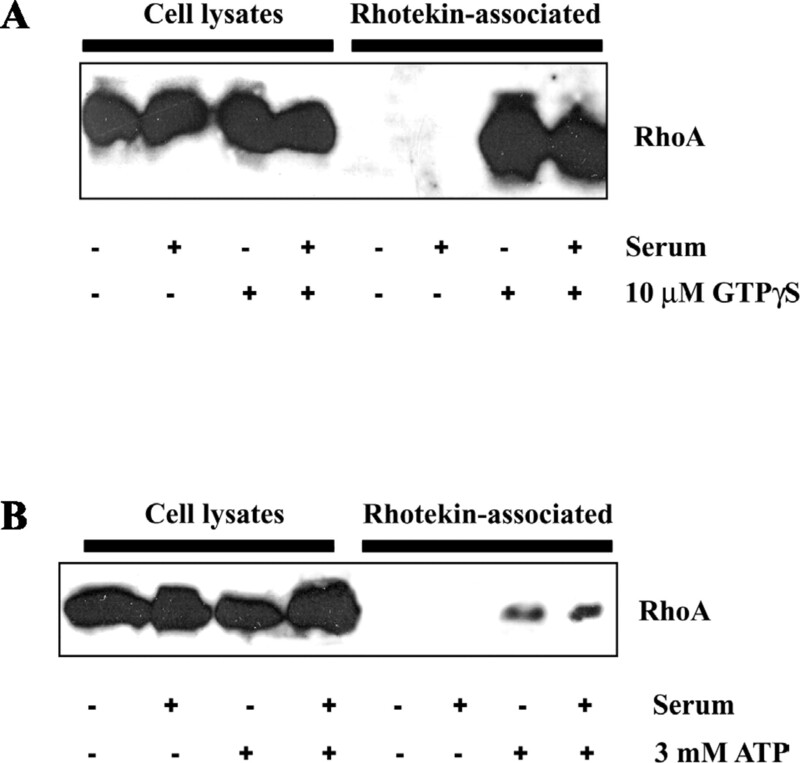 Rhotekin is a downstream effector of RhoA, and the rhotekin-RBD binds specifically to GTP-bound RhoA and inhibits the GTPase activity of RhoA. Thus, the rhotekin-RBD coupled with insoluble beads can be used to isolate GTP-bound RhoA from cell lysates. BAC1 macrophages or HEK-P2X7 cells were assayed for the presence of rhotekin-bound RhoA in the presence or absence of serum, and with or without a 30-min ATP treatment. Serum-free conditions were included because of previous reports suggesting that the presence of serum is sufficient to induce a baseline tonic RhoA activation (44). As shown in Fig. 7⇓A, serum treatment alone is not sufficient to induce significant RhoA activation in BAC1 macrophages, and treatment of the cell lysates with 10 μM GTPγS for 30 min at 30°C to activate small GTPases yielded significant RhoA binding to rhotekin beads, regardless of serum. Fig. 7⇓B indicates that treatment of macrophages with 3 mM ATP can activate RhoA, regardless of the presence of serum. Similar results were obtained with HEK-P2X7 cells, and furthermore, use of 200 μM BzATP as an agonist was sufficient to induce RhoA activation, whereas 100 μM ADP was unable to initiate RhoA activation (data not shown), suggesting that the RhoA activation was due to P2X7R stimulation alone. ATP induction of RhoA activation. For all experiments, BAC1 macrophages were plated at 1 × 10 6/ml in the presence or absence of serum in the culture medium, as indicated. A, Cells were lysed in rhotekin lysis/wash buffer, followed by incubation with 10 μM GTPγS for 30 min at 30°C as indicated and subsequent incubation with rhotekin beads overnight at 4°C to bind all activated RhoA. The beads were washed and the bound RhoA was dissociated by boiling in SDS-PAGE buffer, and samples of the cell lysate before rhotekin incubation and of the rhotekin-associated fraction were separated on a 15% SDS-PAGE gel. Gels were transferred to PVDF membrane and probed for RhoA. As indicated, the presence of serum in the culture medium does not induce activation of RhoA, and GTPγS markedly activates RhoA regardless of the presence or absence of serum. B, Cells were treated with or without 3 mM ATP in BSS for 30 min at 37°C before lysis in rhotekin lysis/wash buffer as described for A. As shown, treatment with ATP induces activation of RhoA, regardless of the presence or absence serum in the culture medium. Although it is clear that P2X7R activation is critical for the rapid ATP-induced processing and release of IL-1β from activated macrophages, the mechanism by which this activity is facilitated is not well understood. To address this question and to gain insight into P2X7R-dependent effects on cell membranes and morphology, we used phase-contrast and fluorescence microscopy to examine the cellular response to extracellular nucleotides, coupled with biochemical analysis of IL-1β processing and release from macrophages. We demonstrate here that P2X7R activation in BAC1 macrophages is a potent stimulus for IL-1β processing and release, while simultaneously initiating a novel form of tethered blebbing distinct from the zeiotic blebbing observed in HEK-P2X7 cells treated with ATP. Mechanistically, we determined that both zeiotic blebbing in HEK-P2X7R cells and tethered blebbing in macrophages are disrupted by inhibitors of the ROCKs, analogous to apoptotic blebbing. Furthermore, ROCK inhibitors, although they disrupt ATP-induced tethered blebbing in macrophages, had no effect on IL-1β processing and release. Conversely, blockade of IL-1β processing and release with caspase inhibitors had no effect on tethered blebbing in macrophages. Finally, P2X7R activation specifically leads to RhoA activation in both macrophages and HEK-P2X7 cells. The sum of these data indicates that that these processes are the result of divergent signaling cascades initiated by the P2X7R. In defining the mechanism by which the P2X7R initiates blebbing, several points must be considered. The observation that BzATP can only induce bleb formation at concentrations of 3 mM or above suggests that two separate events are necessary for appropriate blebbing: first, agonist must bind and activate the receptor, and second, the high nucleotide concentrations must also chelate Ca2+ and Mg2+ in the extracellular medium. The functional potency for BzATP occurs at concentrations 10- to 50-fold less than was necessary for initation of blebbing. We and others have shown that P2X7R activation by 100 μM BzATP in BAC1 macrophages can be measured by K+ efflux, pore formation, and IL-1β secretion (36, 45). Nucleotides themselves are capable of chelating both Ca2+ and Mg2+, but it is the nonchelated, ATP4− form that is the relevant ligand for P2X7R-dependent activation. Thus, the coordination of ATP with divalent cations has complicated accurate determination of the physiological EC50 for the P2X7R given that millimolar concentrations of ATP are necessary for maximal activation of this receptor (15). Because the P2X7R is a divalent cation channel, chelation of free Ca2+ and Mg2+ by millimolar ATP/BzATP will alter the flux of cations across the membrane in response to P2X7R activation. Indeed, we have observed that if blebbing experiments are conducted in the presence of EDTA or EGTA to chelate extracellular divalent cations or in the absence of extracellular divalent cations, much lower concentrations of agonist are necessary to induce blebbing (data not shown), such that 300 μM ATP is sufficient to activate blebbing in either macrophages or HEK-P2X7 cells. However, under these same conditions, IL-1β processing and release are markedly attenuated, thereby further dissociating blebbing from IL-1β secretion and implying an important role for Ca2+ and/or Mg2+ in P2X7R-dependent IL-1β release (46). The possibility remains that activation of the P2X7R alone is not sufficient to induce blebbing, given that both BAC1 macrophages and HEK-P2X7 cells express P2Y family receptors. Our data strongly suggest that the P2X7R is absolutely necessary, given the results with both P2X7R inhibitors and a P2X7R-specific agonist. However, to test the hypothesis that P2Y receptors are involved, we would need to know which receptors are expressed and then have selective antagonists for those receptors, which are currently unavailable. Alternatively, we could use macrophages derived from a P2YR-knockout mouse; at this time, only the P2Y1 and P2Y2 knockout mice are available. Future studies will likely elucidate a potential role for P2Y receptors in blebbing or in other P2X7R-associated phenomena. Both Y-27632 and Fasudil have been reported to be relatively selective for only ROCK-I and ROCK-II (which share 90% homology in the kinase domain) at the concentrations used in this study (40, 41). However, it is not known in this study which of the ROCK isoforms is facilitating bleb formation. We presumed a role for ROCK-I, given prior studies implicating ROCK-I activity specifically in bleb formation during apoptosis (29, 31). However, because BAC1 macrophages express both ROCK-I and ROCK-II, either kinase could be involved in this P2X7R-dependent activity (data not shown). We were unable to detect, by Western analysis, cleavage of either ROCK-I or ROCK-II to a constitutively active form, analogous to the processing observed during apoptosis of other cell types in which caspase-3 cleaves ROCK-I, but not ROCK-II, at a sequence-specific site (data not shown). However, inhibition of caspase-3 or caspase-1 did not block blebbing, indicating that caspase-mediated proteolytic activity is not necessary for the blebbing induced by P2X7R activation. Furthermore, ATP-dependent RhoA activation can be detected, suggesting that both ROCK-I and ROCK-II should be active. Indeed, phospholipase D (PLD) activation by RhoA is well documented, and our lab demonstrated that P2X7R stimulation can also lead to PLD activation. P2X7R-dependent RhoA activation may provide the missing link between PLD and P2X7R (36, 47, 48). A recent report has indicated that ectopic overexpression of ROCK-II can induce membrane blebbing and chromatin condensation consistent with those changes seen in apoptosis, even in the absence of caspase-dependent processing (49). We are currently testing the hypothesis that the P2X7R signals through activation of ROCK-II to induce the morphological changes seen in this study. The objective of this study was to explore a possible correlation between P2X7R-induced membrane blebbing and IL-1β processing and release, given that both events are occurring simultaneously in the proinflammatory macrophage in response to millimolar ATP. However, a couple findings indicated that blebbing and IL-1β secretion can be dissociated: 1) the distinct concentration-response profiles for ATP and BzATP, and 2) the pharmacological inhibitor profiles using ROCK and caspase inhibitors. The summation of these results, then, suggests the existence of multiple parallel pathways initiated by agonist occupancy of the P2X7R. At one level, ATP binding to the P2X7R will stimulate a loss of K+ from the cell and allow rapid and efficient caspase-1 activation, leading to the processing and externalization of IL-1β, independent of ROCK activity, and presumably RhoA activity, although the effect of inhibition of RhoA on IL-1β processing was not specifically tested in this study. However, P2X7R activation by higher concentrations of ATP will stimulate a dramatic membrane blebbing event, which may be disrupted by ROCK inhibitors and which is caspase independent. But what then is the functional relevance of tethered blebbing, if it is not related to cytokine processing? We do not believe that P2X7R-induced blebbing per se is necessary for P2X7R-induced cell death. We have previously shown that a 30-min, 3 mM ATP pulse is sufficient to activate hallmark signs of apoptosis within 4 h in both BAC1 macrophages and HEK-P2X7 cells (18). Although it is intriguing that ROCKs regulate both P2X7R-dependent blebbing and apoptotic blebbing (either P2X7R-dependent or not), it does not seem likely that blockade of P2X7R-induced blebbing will disrupt P2X7R-dependent apoptosis; however, ROCK inhibition may still prevent blebbing associated with apoptosis induced by ATP treatment. A possible role for P2X7R-induced blebbing is as follows. Transient P2X7R activation can induce a reversible PS flip, but prolonged activation of the P2X7R renders this PS flip irreversible (12). PS externalization on both the engulfing cell and target cell is necessary for recognition and engulfment of the apoptotic cell by macrophages, and so we speculate that at lower concentrations of ATP in the presence of millimolar divalent cations, P2X7R activation facilitates caspase activation, cytokine release, and phagocytosis, whereas activation of blebbing by sustained, elevated concentrations of ATP may act to signal engulfment of the macrophage as a mechanism for feedback inhibition of the innate immune response (50). Cocca et al. (34) have identified an Ab associated with systemic lupus erythematosus that specifically localizes to the membranes of ROCK-I-dependent apoptotic blebs. It will be interesting to determine whether P2X7R-dependent PS externalization (or packaging of other such epitopes or signaling molecules) occurs specifically at P2X7R-induced blebs, thus acting as a flag for elimination. How does this particular P2X7R-dependent membrane response relate to the proposed mechanism for IL-1β secretion in microvesicles established by MacKenzie et al. (12)? We were unable to detect the shedding of microvesicles by light microscopy in our system, in accord with previously published results suggesting that microvesicles would fall below the level of bright-field microscopy resolution. Microvesicle shedding in other contexts has been demonstrated to be dependent on a significant increase in intracellular Ca2+ from either intracellular or extracellular Ca2+ stores (12, 51). Perhaps the use of such high nucleotide agonists reduces the amount of free extracellular Ca2+ to an extent sufficient to attenuate the amount of Ca2+ that can flow into the cell, thereby blunting the microvesiculation response. Furthermore, the time course of microvesicle shedding is on the order of seconds, with microvesicles distinctly visible within 8 s of BzATP treatment; however, BzATP-induced blebbing is not detectable until at least 75 s after the addition of agonist (12). It may be that sustained activation of the P2X7R overwhelms the cell’s capacity to shed microvesicles, instead facilitating their fusion into the larger, membrane-bound blebs detected minutes after microvesiculation. We are testing this hypothesis by determining the subcellular localization of caspase-1 activity and IL-1β in the macrophage, exploring the possibility that these proteins may be confined to the membrane blebs. In summary, we have characterized blebbing in response to P2X7R activation and found that this blebbing can be readily dissociated from IL-1β processing and release, which is occurring cotemporally in the LPS-activated macrophage. Furthermore, this is the first demonstration that the P2X7R can activate RhoA and its downstream effectors, the ROCKs, in both the heterologously P2X7R-expressing HEK-P2X7 cells and BAC1 macrophages. Such understanding of the P2X7R in the innate immune system has clear relevance in terms of macrophage biology and the regulation of inflammation. We thank Lalitha Gudipaty for helpful discussions, Sylvia Kertesy for excellent technical assistance, and Andrew Schade and Dr. Alexander Garber for critical reading of the manuscript. ↵1 This work was supported in part by National Institutes of Health Grant GM36387 (to G.R.D.). P.A.V. was supported by Medical Scientist Training Program Grant GM07520-24 from the National Institutes of Health. ↵3 Abbreviations used in this paper: ABC, ATP-binding cassette; BzATP, 3′-O-(4-benzoyl)benzoyl-ATP; MTX, maitotoxin; HEK, human embryonic kidney; ROCK, Rho-effector kinase; HEK-P2X7, HEK293 cells expressing recombinant P2X7R; oATP, oxidized ATP; YVAD-cmk, Tyr-Val-Ala-Asp-chloromethyl ketone; DEVD-cmk, Asp-Glu-Val-Asp-chloromethyl ketone; PS, phosphatidylserine; BSS, buffered saline solution; PVDF, polyvinylidene difluoride; RBD, Rho-binding domain; PLD, phospholipase D.
↵4 The on-line version of this article contains supplemental material. Dinarello, C. A.. 1996. Biologic basis for interleukin-1 in disease. Blood 87:2095. Wang, S., M. Miura, Y. K. Jung, H. Zhu, E. Li, J. Yuan. 1998. Murine caspase-11, an ICE-interacting protease, is essential for the activation of ICE. Cell 92:501. Martinon, F., K. Burns, J. Tschopp. 2002. The inflammasome: a molecular platform triggering activation of inflammatory caspases and processing of proIL-β. Mol. Cell 10:417. Perregaux, D. G., P. McNiff, R. Laliberte, M. Conklyn, C. A. Gabel. 2000. ATP acts as an agonist to promote stimulus-induced secretion of IL-1β and IL-18 in human blood. J. Immunol. 165:4615. Perregaux, D. G., K. Bhavsar, L. Contillo, J. Shi, C. A. Gabel. 2002. Antimicrobial peptides initiate IL-1β posttranslational processing: a novel role beyond innate immunity. J. Immunol. 168:3024. Perregaux, D., C. A. Gabel. 1994. Interleukin-1β maturation and release in response to ATP and nigericin: evidence that potassium depletion mediated by these agents is a necessary and common feature of their activity. J. Biol. Chem. 269:15195. Perregaux, D., J. Barberia, A. J. Lanzetti, K. F. Geoghegan, T. J. Carty, C. A. Gabel. 1992. IL-1β maturation: evidence that mature cytokine formation can be induced specifically by nigericin. J. Immunol. 149:1294. Mehta, V. B., J. Hart, M. D. Wewers. 2000. ATP stimulated release of IL-1β and IL-18 requires priming by LPS and is independent of caspase-1 cleavage. J. Biol. Chem. 30:30. Hogquist, K. A., E. R. Unanue, D. D. Chaplin. 1991. Release of IL-1 from mononuclear phagocytes. J. Immunol. 147:2181. Hamon, Y., M. F. Luciani, F. Becq, B. Verrier, A. Rubartelli, G. Chimini. 1997. Interleukin-1β secretion is impaired by inhibitors of the ATP binding cassette transporter, ABC1. Blood 90:2911. Hamon, Y., M. Luciani, G. Chimini. 1997. Mammalian ABC transporters and leaderless secretion: facts and speculations. K. Kuchler, and A. Rubartelli, and B. Holland, eds. Unusual Secretory Pathways: From Bacteria to Man 137. R.G. Landes Company, Georgetown, TX. MacKenzie, A., H. L. Wilson, E. Kiss-Toth, S. K. Dower, R. A. North, A. Surprenant. 2001. Rapid secretion of interleukin-1β by microvesicle shedding. Immunity 15:825. Dubyak, G. R.. 2000. Role of P2 receptors in the immune system. M. Williams, and M. P. Abbracchio, eds. Handbook of Experimental Pharmacology: Purinergic and Pyrimidinergic Signaling 323. Springer-Verlag, Berlin. Di Virgilio, F., P. Chiozzi, D. Ferrari, S. Falzoni, J. M. Sanz, A. Morelli, M. Torboli, G. Bolognesi, O. R. Baricordi. 2001. Nucleotide receptors: an emerging family of regulatory molecules in blood cells. Blood 97:587. Surprenant, A., F. Rassendren, E. Kawashima, R. A. North, G. Buell. 1996. The cytolytic P2Z receptor for extracellular ATP identified as a P2X receptor (P2X7). Science 272:735. Schilling, W. P., T. Wasylyna, G. R. Dubyak, B. D. Humphreys, W. G. Sinkins. 1999. Maitotoxin and P2Z/P2X(7) purinergic receptor stimulation activate a common cytolytic pore. Am. J. Physiol. 277:C766. Schilling, W. P., W. G. Sinkins, M. Estacion. 1999. Maitotoxin activates a nonselective cation channel and a P2Z/P2X(7)-like cytolytic pore in human skin fibroblasts. Am. J. Physiol. 277:C755. Humphreys, B. D., J. Rice, S. B. Kertesy, G. R. Dubyak. 2000. Stress-activated protein kinase/JNK activation and apoptotic induction by the macrophage P2X7 nucleotide receptor. J. Biol. Chem. 275:26792. Ferrari, D., P. Chiozzi, S. Falzoni, M. Dal Susino, L. Melchiorri, O. R. Baricordi, F. Di Virgilio. 1997. Extracellular ATP triggers IL-1β release by activating the purinergic P2Z receptor of human macrophages. J. Immunol. 159:1451. Solle, M., J. Labasi, D. G. Perregaux, E. Stam, N. Petrushova, B. H. Koller, R. J. Griffiths, C. A. Gabel. 2001. Altered cytokine production in mice lacking P2X(7) receptors. J. Biol. Chem. 276:125. Labasi, J. M., N. Petrushova, C. Donovan, S. McCurdy, P. Lira, M. M. Payette, W. Brissette, J. R. Wicks, L. Audoly, C. A. Gabel. 2002. Absence of the P2X(7) receptor alters leukocyte function and attenuates an inflammatory response. J. Immunol. 168:6436. Virginio, C., A. MacKenzie, R. A. North, A. Surprenant. 1999. Kinetics of cell lysis, dye uptake and permeability changes in cells expressing the rat P2X7 receptor. J. Physiol. 519:(Pt. 2):335. Zwaal, R. F., A. J. Schroit. 1997. Pathophysiologic implications of membrane phospholipid asymmetry in blood cells. Blood 89:1121. Keller, H., P. Rentsch, J. Hagmann. 2002. Differences in cortical actin structure and dynamics document that different types of blebs are formed by distinct mechanisms. Exp. Cell Res. 277:161. Hagmann, J., M. M. Burger, D. Dagan. 1999. Regulation of plasma membrane blebbing by the cytoskeleton. J. Cell. Biochem. 73:488. Costero, I., C. M. Pomerat. 1951. Cultivation of neurons from the adult human cerebral and cerebellar cortex. Am. J. Anat. 89:405. Estacion, M., W. P. Schilling. 2002. Blockade of maitotoxin-induced oncotic cell death reveals zeiosis. BMC Physiol. 2:2. Cohen, J. J., R. C. Duke, V. A. Fadok, K. S. Sellins. 1992. Apoptosis and programmed cell death in immunity. Annu. Rev. Immunol. 10:267. Coleman, M. L., E. A. Sahai, M. Yeo, M. Bosch, A. Dewar, M. F. Olson. 2001. Membrane blebbing during apoptosis results from caspase-mediated activation of ROCK I. Nat. Cell Biol. 3:339. Packard, B. Z., A. Komoriya, T. M. Brotz, P. A. Henkart. 2001. Caspase 8 activity in membrane blebs after anti-Fas ligation. J. Immunol. 167:5061. Sebbagh, M., C. Renvoize, J. Hamelin, N. Riche, J. Bertoglio, J. Breard. 2001. Caspase-3-mediated cleavage of ROCK I induces MLC phosphorylation and apoptotic membrane blebbing. Nat. Cell Biol. 3:346. Estacion, M., W. P. Schilling. 2001. Maitotoxin-induced membrane blebbing and cell death in bovine aortic endothelial cells. BMC Physiol. 1:2. Inbal, B., S. Bialik, I. Sabanay, G. Shani, A. Kimchi. 2002. DAP kinase and DRP-1 mediate membrane blebbing and the formation of autophagic vesicles during programmed cell death. J. Cell Biol. 157:455. Cocca, B. A., A. M. Cline, M. Z. Radic. 2002. Blebs and apoptotic bodies are B cell autoantigens. J. Immunol. 169:159. Cunningham, C. C.. 1995. Actin polymerization and intracellular solvent flow in cell surface blebbing. J. Cell Biol. 129:1589.
el-Moatassim, C., G. R. Dubyak. 1992. A novel pathway for the activation of phospholipase D by P2Z purinergic receptors in BAC1.2F5 macrophages. J. Biol. Chem. 267:23664. Humphreys, B. D., C. Virginio, A. Surprenant, J. Rice, G. R. Dubyak. 1998. Isoquinolines as antagonists of the P2X7 nucleotide receptor: high selectivity for the human versus rat receptor homologues. Mol. Pharmacol. 54:22. Falzoni, S., M. Munerati, D. Ferrari, S. Spisani, S. Moretti, F. Di Virgilio. 1995. The purinergic P2Z receptor of human macrophage cells: characterization and possible physiological role. J. Clin. Invest. 95:1207. Alonso-Torre, S. R., A. Trautmann. 1993. Calcium responses elicited by nucleotides in macrophages: interaction between two receptor subtypes. J. Biol. Chem. 268:18640. Amano, M., Y. Fukata, K. Kaibuchi. 2000. Regulation and functions of Rho-associated kinase. Exp. Cell Res. 261:44. Davies, S. P., H. Reddy, M. Caivano, P. Cohen. 2000. Specificity and mechanism of action of some commonly used protein kinase inhibitors. Biochem. J. 351:95. Ferrari, D., M. Los, M. K. Bauer, P. Vandenabeele, S. Wesselborg, K. Schulze-Osthoff. 1999. P2Z purinoreceptor ligation induces activation of caspases with distinct roles in apoptotic and necrotic alterations of cell death. FEBS Lett. 447:71. Enari, M., R. V. Talanian, W. W. Wong, S. Nagata. 1996. Sequential activation of ICE-like and CPP32-like proteases during Fas-mediated apoptosis. Nature 380:723. Alblas, J., L. Ulfman, P. Hordijk, L. Koenderman. 2001. Activation of RhoA and ROCK are essential for detachment of migrating leukocytes. Mol. Biol. Cell 12:2137. Chessell, I. P., A. D. Michel, P. P. Humphrey. 1998. Effects of antagonists at the human recombinant P2X7 receptor. Br. J. Pharmacol. 124:1314. Gudipaty, L. G., J. Munetz, P. A. Verhoef, and G. R. Dubyak. 2003. Essential role for Ca2+ in the regulation of IL-1β secretion by the P2X7 nucleotide receptor in monocytes, macrophages, and HEK293 fibroblasts. Am. J. Physiol. In press. Bowman, E. P., D. J. Uhlinger, J. D. Lambeth. 1993. Neutrophil phospholipase D is activated by a membrane-associated Rho family small molecular weight GTP-binding protein. J. Biol. Chem. 268:21509. Kwak, J. Y., I. Lopez, D. J. Uhlinger, S. H. Ryu, J. D. Lambeth. 1995. RhoA and a cytosolic 50-kDa factor reconstitute GTPγS-dependent phospholipase D activity in human neutrophil subcellular fractions. J. Biol. Chem. 270:27093. Song, Y., B. Q. Hoang, D. D. Chang. 2002. ROCK-II-induced membrane blebbing and chromatin condensation require actin cytoskeleton. Exp. Cell Res. 278:45. Marguet, D., M. F. Luciani, A. Moynault, P. Williamson, G. Chimini. 1999. Engulfment of apoptotic cells involves the redistribution of membrane phosphatidylserine on phagocyte and prey. Nat. Cell Biol. 1:454. Fox, J. E., C. D. Austin, C. C. Reynolds, P. K. Steffen. 1991. Evidence that agonist-induced activation of calpain causes the shedding of procoagulant-containing microvesicles from the membrane of aggregating platelets. J. Biol. Chem. 266:13289.